Houston is a true melting pot of cuisines with none more significant to the overall culinary experience than the next. In recent decades, Indian, South Asian, Middle Eastern and African cuisines have played increasingly prominent roles in the city, adding respective flavors and cooking techniques. Despite the vast culinary breadth Houston enjoys, Tex-Mex remains the defining cuisine of the city — and the state. It is the original fusion concept of the southwest marrying simple ingredients like beans and tortillas with decadent additions of cheese and rich sauces. Within the canon of Tex-Mex no dish is more recognized, more beloved or more argued over than the beef fajita. The fajita’s origin has long been the focus of debate and its composition and identity falsely claimed, loosely defined and bastardized for as long as it’s been a known culinary commodity. In 2005, Virginia B. Wood wrote a comprehensive history of the dish for the Austin Chronicle. In it, she traces the preparation of fire-grilled skirt steak in flour tortillas to the Mexican ranch hands of the Rio Grande Valley and West Texas during the early 20th century. At the time, skirt steak, heads and entrails were considered low quality trimmings and were used as payment to Mexican ranch hands during cattle drives. The Spanish word “faja” literally translates to belt or griddle which is a reference to the steak’s location along the underbelly of the cow. Today, fajitas are everywhere — from fine dining Mexican kitchens to fast-food menus. Over time, its official definition stretched to include higher grades of beef like prime and wagyu, finer cuts like sirloin and filet and even proteins like chicken, shrimp and lobster. 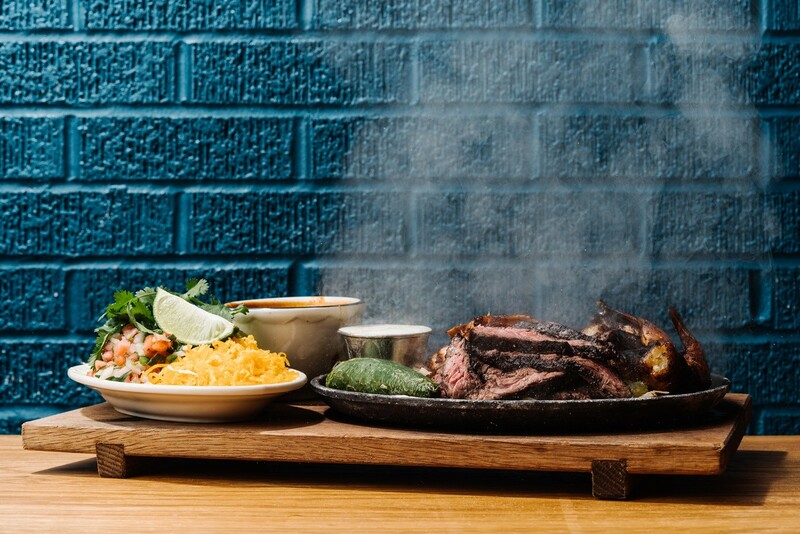 Although Houston’s selection of fajita platters rivals its number of Starbucks, this series aims to highlight a handful of establishments serving the best version of traditional skirt steak fajitas in the city. 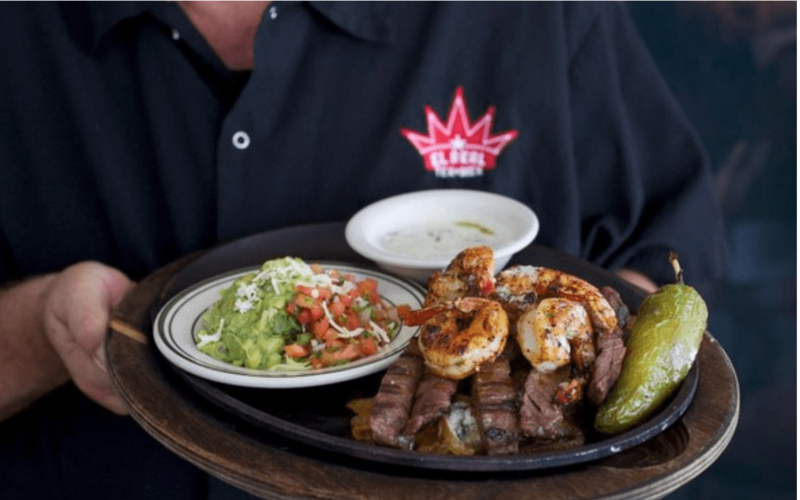 El Real, 1201 Westheimer: We begin with a beloved Houston Tex-Mex kitchen serving a fajita platter that has received countless accolades, including those from Houston Food Finder publisher and editor Phaedra Cook during her time at The Houston Press. Housed within a renovated movie theater in Montrose, El Real was founded by noted restaurant critic Robb Walsh, restaurateur Bill Floyd and chef Bryan Caswell. It is often touted as one of the best examples of Tex-Mex in the country. The kitchen’s famous “sizzling fajitas” make a fine argument. The dish combines hot strips of tender, marinated skirt steak slathered in butter and garlic served with caramelized onions and housemade flour tortillas. It’s part traditional and part refined, just like the restaurant itself. El Tiempo Cantina, multiple locations: When the Laurenzo family sold their rights to the Ninfa’s brand following the company’s well-documented bankruptcy in the mid-nineties, they also agreed that Mama Ninfa herself would not be involved in the opening or promoting of any competing Tex-Mex restaurants. The contract did not, however, bar her from standing at the entrance of her son Roland’s spin-off concept, El Tiempo Cantina, when it opened two years later. As such, local folk lore has it that Ninfa Laurenzo would greet guests as they entered the newly opened El Tiempo Cantina on Richmond back in 1998. El Tiempo is a continuation of Ninfa Laurenzo’s legacy. 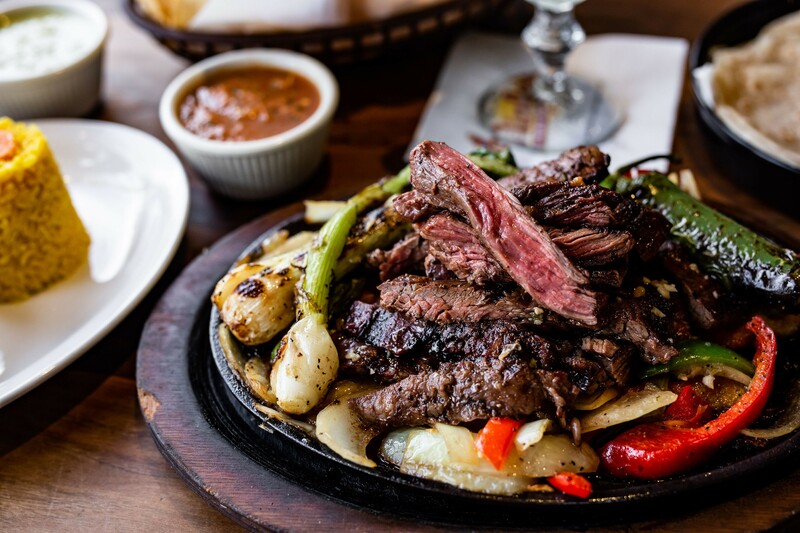 Chef and owner Roland Laurenzo has continued serving his mother’s famous fajitas for the past 21 years using her recipes for grilled skirt steak and flour tortillas. Naturally, the chef-owner has expanded on those original offerings with a sprawling menu that includes parilla platters served on a table-top parilla grill, fajita offerings that range from filet to quail and a full bore Tex-Mex menu with all the traditional fixings. Still, the classic beef fajitas remain the brand’s main attraction. Beef fajitas and quail with all the accoutrements at Goode Co. Kitchen & Cantina. Photo by Phaedra Cook. Goode Company Kitchen & Cantina, Multiple locations: The Goode name used to be synonymous with quality barbecue and while that reputation has taken a hit in recent years, the company is experiencing a revival with an impressive new direction. Levi Goode, son of Goode Company founder Jim Goode, is leading the charge with south-of-the-border fare. Starting with the Goode Company Taqueria on Kirby and more recently with the Kitchen & Cantina concept, the Goode name is now more closely associated with top notch Tex-Mex than barbecue. Goode Company Kitchen & Cantina originally opened in The Woodlands and is one of Houston’s best options for seriously refined Tex-Mex with a heavy focus on the “Mex”. The menu features authentic Mexican staples reimagined with a beef-loving Texan attitude. 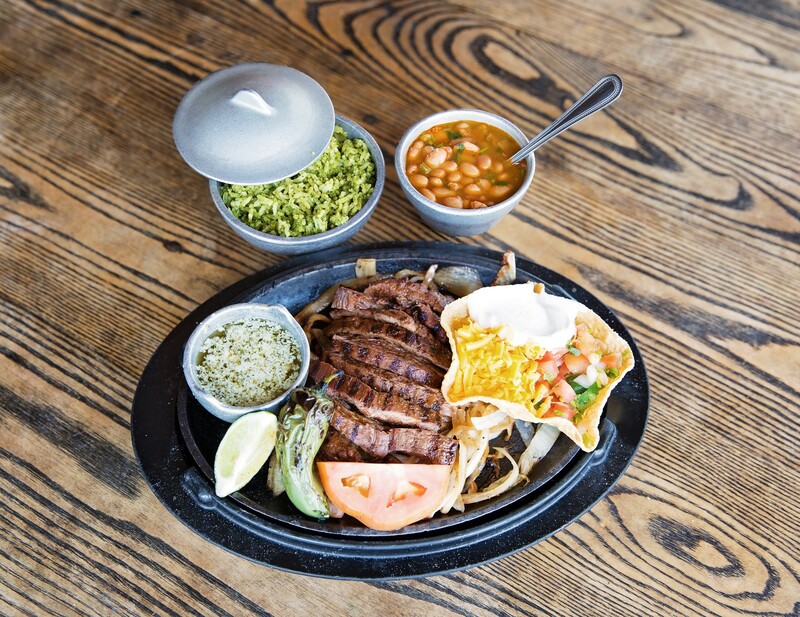 One of those revisited classics is the mesquite grilled fajita platter. Sizzling, moist and tender, the beef fajitas are served with all the classic accoutrements plus soft and doughy housemade flour tortillas and a side of melted jalapeño lime butter. Beyond beef, the kitchen also offers fillings of chicken, jalapeño smoked sausage, quail, Gulf shrimp and pulled pork carnitas, the latter of which we argue is the best protein on the menu. Lupe Tortilla, Multiple locations: Stan Holt grew up eating at Houston’s hole-in-the-wall Mexican restaurants in the 1960’s and 70’s. When he decided to open the first Lupe Tortilla in West Houston in 1983, he modeled it after those old school kitchens he loved so much. The Lupe story is not unlike so many of the names on our list. A beloved local institution that helped popularize fajitas as a Tex-Mex staple, it is now a full-blown chain and household name. Yet, unlike so many home-grown restaurant chains, the Lupe Tortilla brand never lost its reputation for extremely good fajitas despite its rapid growth. The legacy of Lupe Tortilla, though often over-looked, plays a vital role in the popularization of both fajitas and Tex-Mex in general. 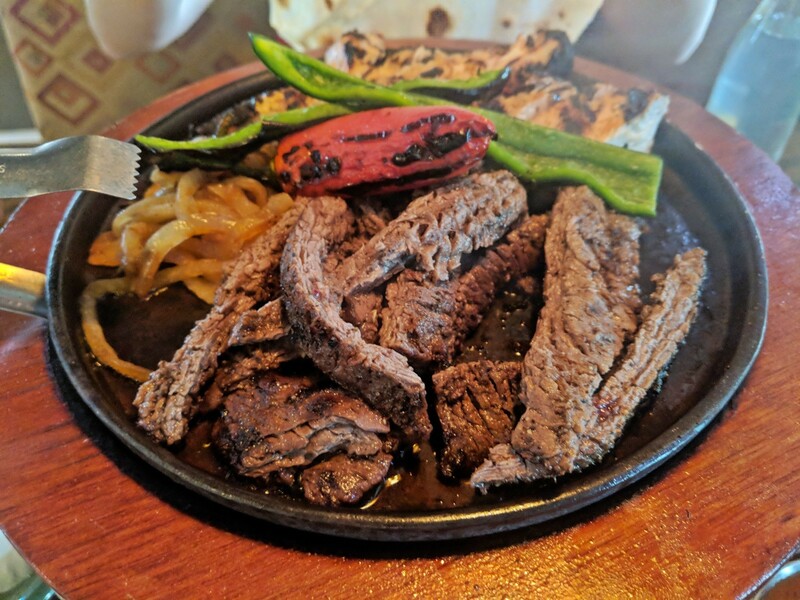 Lupe’s fajitas stand out as some of the best in town thanks to the signature lime-marinated and tenderized skirt steak recipe. Thanks to this proprietary preparation, these fajitas aren’t tough but instead have a bite more akin to strip steak. They are always served sizzling with generous helpings of onions, peppers, sour cream, pico de gallo and the house’s famous burrito-sized flour tortillas. The Original Ninfa’s, 2704 Navigation: There is absolutely no denying Ninfa Laurenzo’s contributions to Tex-Mex as a globally recognized cuisine, nor her place in Houston’s culinary history. The late entrepreneur turned an East End tortilla factory into the most recognizable name in Tex-Mex, popularized fajitas and put Houston food on the map during her lifetime. Though today the the Ninfa’s brand is little more than Mexican fast-food, her legacy within the cuisine remains intact and this is especially true following the 2006 acquisition of her original Navigation Boulevard restaurant by locally-owned restaurant group Legacy Restaurants. In 2012 Legacy hired Honduran-born executive chef Alex Padilla who has a personal link to the restaurant: his mother once worked as a line cook in the original Ninfa’s kitchen. Padilla has perfected the original fajita recipe and revived the dish and the menu with the quality one would expect from a classically trained chef. After years of devoted effort, his work was finally recognized this year with a James Beard nomination for Best Restaurant Southwest. Though not a finalist, the mere recognition is enough to validate both the full circle of Padilla’s career and Ninfa’s lasting influence on the food she helped take from taco stands in the Rio Grande Valley to acclaimed regional cuisine. 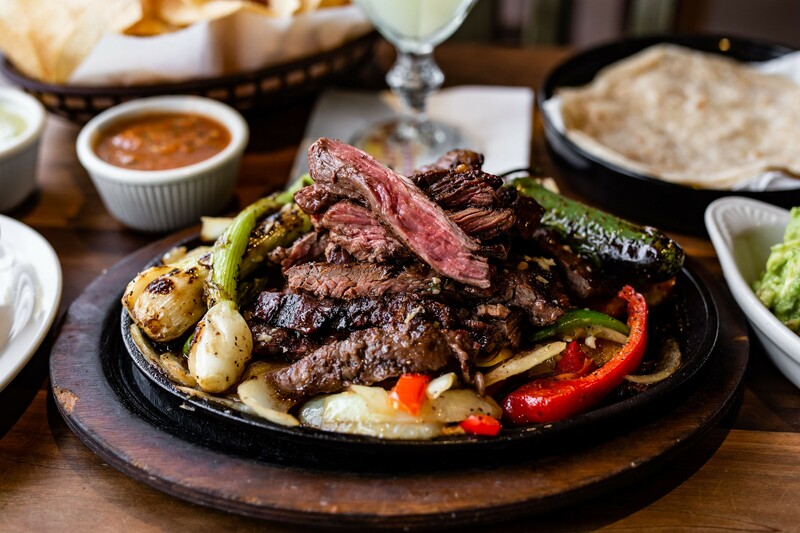 Superica, 1801 North Shepherd: The newest member of our essential fajitas list is the extremely popular Tex-Mex concept founded by Texas native and Atlanta-based restaurateur Ford Fry. The Heights restaurant, which opened late 2018 beside its sister concept La Lucha, is the fourth in Fry’s small but growing line of clean-cut Tex-Mex kitchens with a dive-y southwestern ambiance. Superica is a genuinely refined Tex-Mex concept that elevates the cuisine beyond its limited boundaries while staying true to traditional dishes and presentation. If the fact that a newly-opened out-of-town Tex-Mex concept made multiple best-of 2018 lists comes as any surprise, you probably haven’t dined there yet. The Superica menu is brimming with some of the highest quality Tex-Mex dishes in Houston, including classically prepared skirt-steak fajitas. The tender strips of beef are marinated and grilled over wood, then served alongside Mexican butter, lettuce, pico de gallo, guacamole, sour cream, cheese, charro beans and fresh-made flour tortillas. Even without the use of non-canon gimmicks like prime cuts or Japanese beef, Superica manages to create a new fajita platter that is both true to the original dish and unique in its own right. 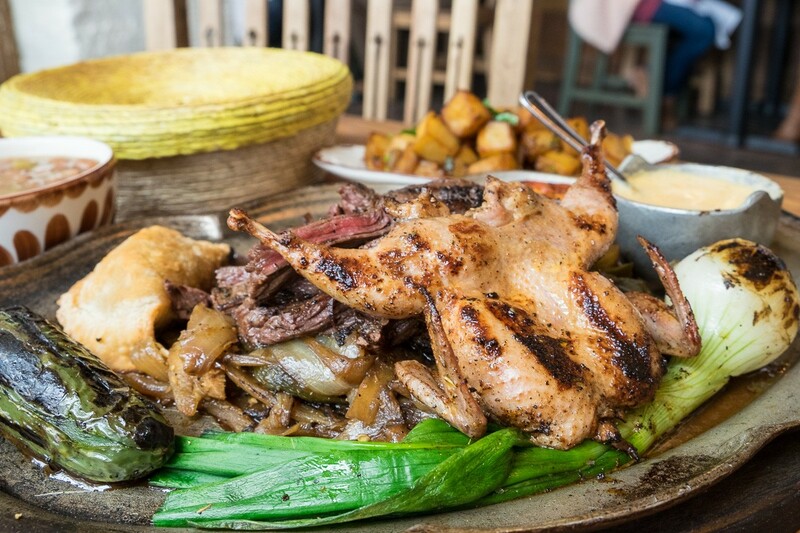 While Houstonians are notoriously protective of their native dishes Superica proves that, when done right, out-of-town concepts can be widely accepted as part of the city’s culinary landscape. Join Jonathan's The Rub at Memorial Green for a special five-course dinner Tuesday, April 24 with one of Napa Valley’s famed winemakers. Reservations are required and all the details are provided below. The Bourbon Brawl Finals by Garrison Brothers Distillery are almost here. Cody Northcutt will be participating and we're sure all #Houston cocktail lovers will be cheering him on. Read the full story by Josh Armendariz. One Houston bartender won a local Garrison Brothers Texas bourbon competition and is going to Austin for the state-level final.